An organized life starts with an organized home. Taking the time to reduce clutter, organize, and get some cleaning done can increase your productivity in unimaginable ways. Therefore, we encourage you to dedicate this month to becoming more organized and see what an impact this change has on your overall lifestyle. Making organized changes can ultimately help in every area of your life. Inside the office and out, organization needs to be prioritized. Even the simplest of changes can make a huge impact and thus, it’s important to start small and work your way up. Whether it’s letting go of items you’re emotionally attached to or organizing your planner, these small changes can really simplify your life. Stay current and experience growth with everyday changes. Once you have things in order and proper storage systems in place, it’s important that you don’t allow things to get back to how they once were. You’ll want to stay on top of the clutter and actively carry out effective organizational strategies to maintain your organization. To help ensure that things don’t get out of hand, schedule decluttering sessions and don’t be afraid to ask for help. Change can benefit you personally and professionally. Not only will becoming more organized increase your productivity at work, but your personal life will also reap the benefits. Through making the right changes, and employing operative time management techniques, you’ll experience less stress and have more time for friends, family, and fun. I can help you make changes to be better organized in your life. Knowing how to get organized can be more difficult than anticipated and having that extra support can really help individuals get started on this lifestyle change. If you find that you’re having a hard time getting organized, don’t hesitate to seek assistance from a professional organizer. I’ve helped many people get their lives in order in a short period of time. No matter how much clutter your home has, or how disorganized your office is, know that organization is just one small step away. I can help organize any area of your home or office for better efficiency and productivity. Rest assured in knowing that I can help you get the job done, no matter what room in your home needs a bit of sprucing up and/or organizing. Through effective organizing systems and strategies, you can increase your productivity in all areas of your life. Call us today at (310) 560-5060 to help you make an organized change in your home and your life. Like us on Facebook! Many businesses face challenges when it comes to bringing their employees together and increasing their productivity. Unfiled paperwork and disorganization is not uncommon in businesses and the need to seek the assistance of a professional often arises. 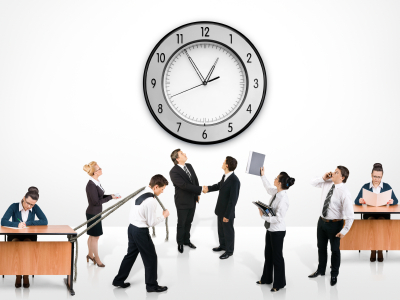 Help your employees understand the importance of efficiency and productivity. In order for your business to function smoothly, your employees need to be on board. Inform them about the importance of maintaining productivity and how it can benefit both them and the company. Ensure that they have an up-to-date and detailed planner, effective time-management skills, and a de-cluttered workspace. By having these very essential components addressed and taken care of, you will be providing your employees with a work environment that promotes efficiency. Increase the value of your business by effectively managing your employees. Of course, your role in the company plays a big part in the success of your business and it’s important that you know how to effectively manage your employees. The lines of communication need to be clear and your employees need to know your expectations and how you want tasks to be carried out in the office. After all, it’s your business and there’s no one who wants it to succeed more than you do. Properly managing employees can keep everyone better organized. Organization is crucial when it comes to operating your business smoothly and efficiently. Encourage your employees to maintain clean and organized desks by implementing organizing systems that make finding files and documents more accessible. Clearly assigning your employees specific tasks and ensuring that they are well executed can maintain a productive work environment. Keeping a day-to-day planner can keep your meetings and appointments scheduled and organized which will, in turn, improve your time management skills. We can put systems into place so that employees can get more done in less time. Notice a decrease in your employees’ work productivity? This is where an organizing professional comes in. We can help your employees and management get rid of their workspace clutter and take proper measures in implementing systems that work effectively for each employee. Whether it’s setting up proper storage bins for their files or clearing up space on their desk, you can rest assured in knowing that your business will see a noticeable increase in productivity. With a Professional Organizer, employees can incorporate better time management, filing systems, and space planning. A messy work environment can take a toll on employees’ ability to get work done. All the things that your business needs to operate at the highest level can be heightened by employing the talents of a Professional Organizer. The office space of your employees will undergo a positive reconstruction, one that will make them work harder, help manage their time properly, and boost your business’s success. Call us today at (310) 560-5060 to help get your business and its employees better organized. Sturdy bags for donations or for those items that need to go to the dry cleaner. A basket for loose change, papers, rubber bands, hair clips, and other things that you might find in the process. You don’t want to have to stop to put away these small items so just put them aside for now into your catch-all basket. Under-the-bed bins. (You can store some of the rarely worn or used items that were in your closet under your bed and free up some valuable space). The next step is to empty the closet completely. Yes, completely. Everything out! 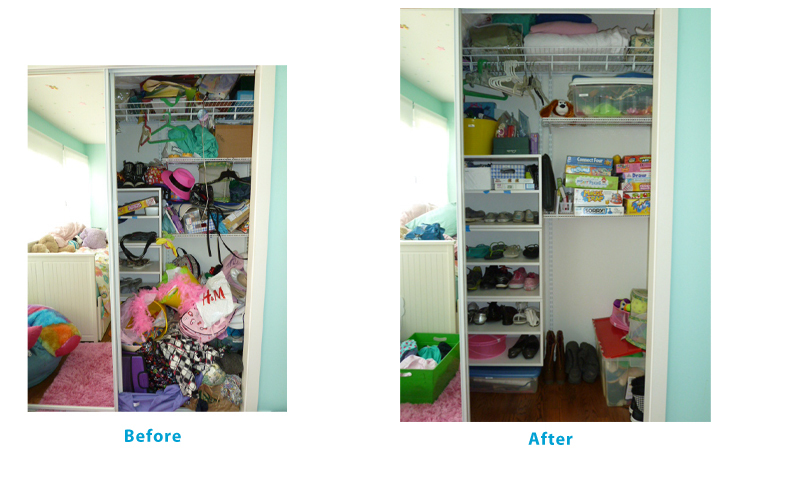 It is best to have a clear, clean space to plan and visualize how you’re going to re-organize your closet. Next, you need to decide what to keep and what to toss or donate. To help you decide, ask yourself these three questions: Do you love it? Do you wear it? Does it fit? If the answer is YES to all 3 questions, then you can place those items into the pile of things to keep. If it doesn’t fit, put it directly into the donation pile along with other items that you no longer like or want. If you have haven’t worn something for more than 6 months, it is probably time to toss it, sell it, or donate it. The next step is to sort through everything and group like items together. For example, put all jackets together, all socks together, dresses with dresses, etc. Now you’re ready to put everything back. The important thing to remember is that you should put things back in a way that makes sense to you. This helps you utilize all of your available space and is easy to maintain. For example, you might want to reserve the front and middle of your closet for clothes you wear most often, making sure your work clothes are easily accessible. Lesser-worn items like formal dresses may be put towards the back of your closet, out-of-season clothes towards the back or on the upper shelves. Finally, I recommend completely re-organizing your closet once a year. Or, you can break it into smaller pieces by organizing seasonally. If you choose to reorganize once a year, choose a date that you’ll remember and make a habit of sticking to it the same time each year. If you choose to do it by season, the first day of each season should make things easy to remember! Call us today at (310) 560-5060 to help you get your closet organized. Unbelievable! Time is going so fast. August has just begun and everyone is already talking about kids going back to school. When I was growing up, school was over at the end of June and started right after Labor Day. Obviously much has changed since then. What hasn’t changed is what we have to do to prepare ourselves and our kids for going back to school. Get back on a schedule two weeks before school starts: Routines are helpful so that everyone knows what to expect. Get your kids back into the groove by reintroducing the ground rules: That means getting to bed earlier; having them read and/or write a little bit every day; taking a few minutes before bedtime to clean up and get ready for the next day. Make sure that everyone is getting enough sleep: Getting your kids to bed earlier at least two weeks before school starts is a great way to reset their internal clocks. Have them read: If they haven’t been reading all summer, have them start again. It is one of the best ways to keep a child’s mind sharp. Make it fun: Take them shopping to get their school supplies and some new clothes. There are a lot of sales this time of year so take advantage of them. Get a calendar and put it in a place where everyone in the family can see it and have access to it. Check it again at night to make sure that everyone knows what’s going on the next day so that they can prepare accordingly. If your child is attending a new school, visit the school before the first day so that he/she can get a feel of the surroundings. This will definitely alleviate some anxiety as the first day in a new school can be a bit scary no matter how old they are. Have them pick out their clothes the night before. Make sure they have the appropriate attire for the next day’s activities. Showers and/or baths should be done at night. In addition to saving time in the mornings when things are more hectic, the warm water will also help them unwind and sleep better. Check homework and make sure that assignments have been completed before bedtime and especially before TV time or any other leisure activities. Get backpacks ready the night before as well. Stick to your morning routine. When the same things are done the same way, as much as possible, kids will automatically know what they are expected to do and when. The less there is to do in the morning, the better it will be for everyone! There will be less fighting and fussing and the mornings will be more pleasant for everyone. Make sure that going back to school is something your children look forward to! 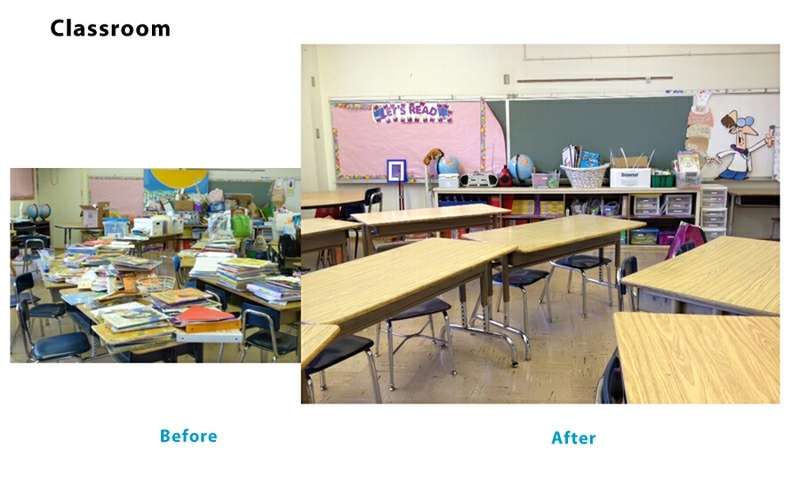 Call us today at (310) 560-5060 to help get you ready and organized for the new school year. Organizing should be a part of every day. Since mornings are usually the busiest time of day as you’re trying to get everyone out of the house on-time, set aside 10-15 minutes at night to make sure that everything is in place for the next day. Homework should be put in backpacks as soon as it is completed and has been checked by a parent. Backpacks should be packed and left at the front door or mudroom. Lunch should be made in the evenings. Clothing should be selected before bedtime. Make sure they have included whatever clothing/instruments they’ll need for the next day’s after-school activities as well (uniforms for practice or instruments for lessons). Establish a routine that works for your family and stick to it. It will make everything easier. Call us at (310) 560-5060 to help you get organized for the new school year. Above is a video that I did for About.com to show you how to organize a junk drawer. For those of you who’d rather read about it than watch the video, here’s some tips on how to organize a junk drawer. Even though it is supposed to be a “junk drawer,” you still should be able to locate items that you keep in there. Believe it or not, your junk drawer can still be “somewhat” organized! The first thing I like to do in any area that I’m going to work on is to empty it out completely. Yep, I’ve said it before and I’m sayin’ it again – empty it out, completely. Then, measure the interior of the drawer and decide which organizing solutions you can use to divide your items. I like using the trays that most people use for their cutlery. However, drawer dividers will do just fine. I also use the boxes that checks come in to help keep the smaller items contained. Begin by purging and tossing any broken items or items that you no longer use. Then put aside anything that doesn’t belong in the “junk drawer” and can be put somewhere else in the house that makes better sense. For example, if you find your checks in there, perhaps you can put them back in your office where you pay your bills. The great thing about junk drawers is that everyone has their own unique junk. However, remember that if you haven’t used it in a few months, it’s just wasting space. Next, start placing all like items together by either category or function. For example, all small tools should be together in one place, all pens and pencils should be together, all small pieces that need to be glued or fixed should be in one place (or maybe even thrown away if you can bring yourself to part with them). You get the idea. Here comes the good part! Put everything back using the trays or dividers by grouping like items together. Even if the contents of your drawer is an array of odd items, the key to an organized drawer is to be able to see what’s in there quickly so that you can grab it when you need it. Upkeep is crucial so go through your junk drawer on a regular basis. If you do, you will always have a general idea of its contents. Call us at (310) 560-5060 to schedule a ½ hour consultation.